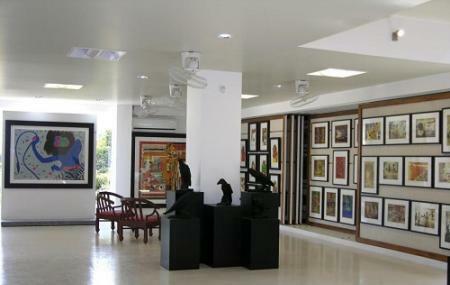 One of the most renowned art places in Ahmedabad today, Archer art gallery actually had a very humble beginning. The place was founded by Anil Relia, the Chairman of Archer Group who himself shares a keen interest in art, photography and serigraphy. It all started in 1978 with a small Designing Studio which he inadvertently named ‘Archer’, but today the place is sprawled in an area of 10,000 sq ft. and has been a proud accommodator of numerous national accolades. It has one of the largest collections of the temporary paintings, sculptures and graphics that you can see in the city, making it one of the revered destinations of artists. The place has garnered recognition of the celebrated artists like M F Hussain, Bhupen Khakhar, Amit Ambalal and the likes. A must place to come if you are into art. How popular is Archer Art Gallery? People normally club together Fernandes Bridge and Sunset Drive In Cinema while planning their visit to Archer Art Gallery. What an amazing place it is. I would like to go there again and again. Great collection of artwork. Ambience is great. Staff is cooperative and calm. A large collection of paintings. Some outstanding. Some very ordinary. Varied names displayed out here. One can learn a lot by observing the work. Felt expensive. Found established and well known names. Just a few starters. I love realistic art. Contemporary & modern art is a compromise in our art performance.